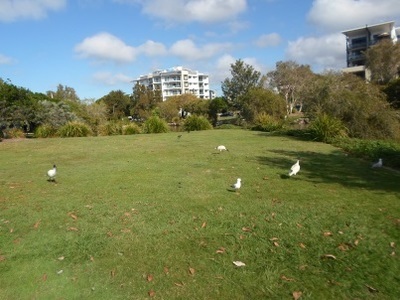 Not far back from the beaches of Redcliffe and Settlement Cove, Humpybong Park offers a place for families to take a stroll and even feed some ducks. The main feature of the space is its creek, which is quite beautiful in places, but there are other nooks to explore or relax in too. 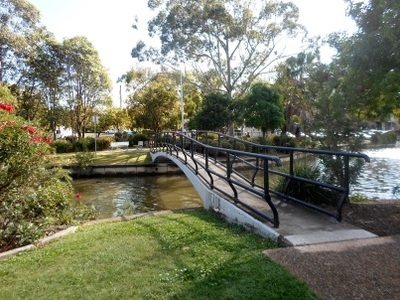 The creeks stretches the length of the long park and is crossed a few times by bridges and surrounded by grass, gardens and chairs. 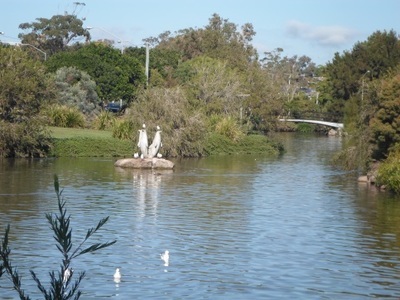 Some of sections created by the curves of the water channel make great picnic areas, or you can just spend some time feeding the ducks (feeding other birds is not permitted however). Other animals that reside at Humpybong Park include fish, eels and frogs. Down one end is what I've heard called one of the biggest fountains ever. It's the main feature in the bigger body of water at the end nearest the beaches. 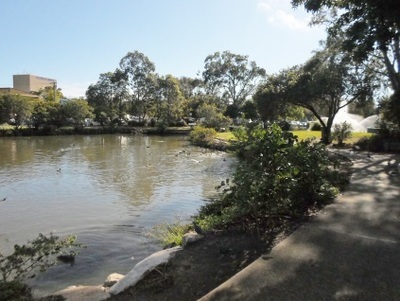 I discovered Humpybong Park and Creek because I needed somewhere to park during the Redcliffe Jetty Markets and you might like to mimic my trip and have lunch here after exploring the stalls. It doesn't have it's own car park, but there's streetside parking around the edges.